Today I'm chugging on with my quilting, but thought I'd spare you yet another shot of it. I'm also keeping on top of the 365 circles, and picked up a couple of shirts this week that I think might help when I run out of fabric from the original three. The first is this check. Some parts of it are very pink, but I would just discard those. The second is this stripe, which looked in the shop like it would be spot on, but which I don't like so much laid out with the squares. I do, however, like it like this. I'm not at the point where I have to make firm decisions yet; I have cut the last of the blue shirt into squares, but there is a surprising amount of the other two left still. But it's good to have this simmering away somewhere in the back of my brain. As always I'm linking up with Kathy for Slow Sunday Stitching. Yes to the stripey strips! I like the idea of random stripe or plaid backgrounds in with all the solids. Love the idea of using old shirting for your circles - and the stitching around each one is a great touch. I do like the interest that the plaid and stripes add! I actually like the stripe better than the plaid, but you must please yourself. Love the idea of a plain block thrown in here and there. I'm sure inspiration will strike that will make you happy. As always I love the hand stitching and what you're doing with the arrangement. Love the stripes in strips especially - but quite like the plaid in there too. Wonder what the plaid might if it was IN the circles here and there? I do enjoy your planning stages - its so inspiring! That looks nice as sashing. I was going to suggest using the stripe in the binding. You probably don't have enough for the whole quilt but it would look neat as part of the binding. 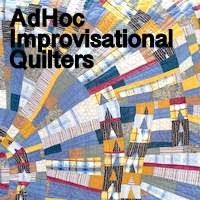 Really like your shirts quilt in the start of it.